The SF State bookstore now incorporates in-store and online rentals for text books to help students pinch every possible penny. Photo by Henry Nguyen. At the corner of 20th and Winston, an empty space sits dark and abandoned with drooping signs in the window, nooks in the walls where wooden shelves and panels once were, and a reinforced lock keeping passersby out. It is the skeletal remains of what was once Borders bookstore, which used to be filled with students sitting cross-legged on the carpet reading, friendly chatter at its cafe and books as far as the eyes could see. It was one of the many bookstores, both corporate and independent, that could not keep afloat in the crumbling market. What may come as a surprise, this is not the case for the SF State campus bookstore. 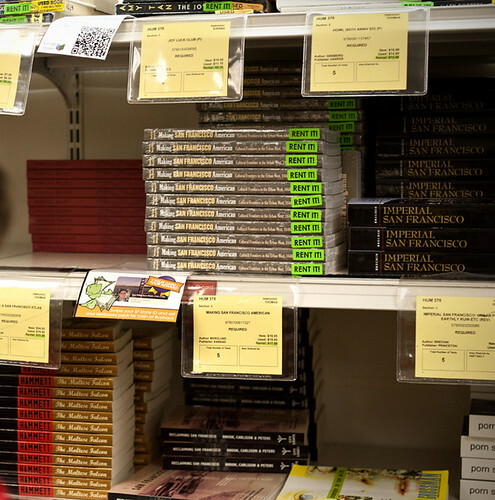 Last school year, from fall 2010 to spring 2011, SF State was part of a pilot textbook rental program along with roughly 200 other college campus bookstores in the nation. Out of those 200 other college campuses SF State was number one in terms of volume. As a result of our campus doing so well, the bookstore has been able to incorporate in-store rental opportunities as well as online textbooks which were both available this semester for students. “As a result I think we have helped students to save close to $400,000 dollars this semester with the rental program,” said Husamettin Erciyes, director of strategic projects and marketing for the bookstore. Even with these new programs it seems each year corporate bookstores continue to swallow up smaller independent bookstores on college campuses within the California State University system. Currently, within the the CSU system only eight of the 23 campuses have bookstores that are independently operated. Fifteen campuses within the system are operated by either Barnes and Noble or the Follett Higher Education Group. Most recently, in April, Barnes and Noble signed a 10-year contract to take over operations of Spartan Bookstore at San Jose State.